In warm regions, bougainvillea blooms almost year around and thrives outdoors. However, northern gardeners will have a bit more work to keep this plant alive and happy during winter. These plants will freeze to the ground when temperatures drop to 30 degrees Fahrenheit (-1 C.) but provided it doesn’t get colder, they usually spring right back when warmer weather appears. Good bougainvillea winter care can ensure a healthy plant that will produce copious quantities of brightly colored flower bracts. Bougainvillea is hardy to United States Department of Agriculture zones 9 to 11. It can withstand a light freeze but deep freezes will kill the roots. In areas below those zones, a bougainvillea in winter should be kept in containers and moved indoors. This takes some special bougainvillea winter care and preparation for the plant to slumber during the cold season. Even warm regions like Texas can experience some pretty sustained freezes and, in some cases, snow and ice. Zone 9 achieves low temperatures between 18 and 28 degrees Fahrenheit (-8 to -2 C.), well below freezing. You can opt to dig up the plant at the end of the season if it is growing in ground or simply keep it in a container. Digging up the plant will stress out the bougainvillea, so it might be best to containerize. That way you won’t take a chance on disturbing the roots. Plants in lower zones absolutely must come indoors. Even those in zone 9 should come indoors for the bulk of the winter unless they are in a protected location or warmer microclimate of the landscape. 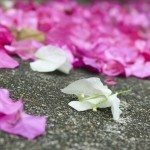 Once moved indoors, there are a few tips on successfully overwintering bougainvillea. Bougainvillea winter care in warm regions consists of ensuring average moisture to the plant. In its dormant state, the plant responds beautifully to pruning and rewards you with more dense growth and colorful bracts. Overwintering bougainvillea indoors takes a bit more planning. The container should be a couple inches larger in diameter than the root ball. Soil takes center stage here. The plants grow in dry soil in their native region but root restricted container plants benefit from rich soil that will retain some moisture. It may be necessary to severely cut back the plant if it was growing rampant and vigorously outside, just to facilitate handling and for space issues. As the leaves begin to brown, remove them to help the plant conserve moisture. Winterizing a bougainvillea also includes watering practices and suspension of fertilizer. NO feeding should take place until late winter or very early spring. Container plants can accumulate salts from fertilizer, so it is wise to flush the container a few days after feeding the plant to prevent root burn. You may also choose to simply top dress the container with well-rotted manure or compost. Situate the containers in a cool area but one that doesn’t freeze. Often, the garage or basement is ideal, but make sure the plant has exposure to sunlight. Part of the care for bougainvillea plants over winter is to keep them a touch on the dry side. As spring nears, gradually increase water. As temperatures outside warm, gradually introduce the plant to more light and warmer temperatures to get it ready to go outdoors. Once all danger of frost has passed, bring the plant outdoors. Read more articles about Bougainvillea.